Here's what I wore yesterday to catch up with few friends in the afternoon. The outfit itself was casual and very simple so I thought I'd brighten things up with a red lipstick especially since it's been ages I wore one and especially that it was matching my newly acquired camera bag. I can't say I was searching for one hard enough but I would occasionally check the shops for something that didn't look like a typical camera bag and I was quite pleased to find this fun version on sale in my local shopping centre. Obviously this leopard baby would have been more than welcome to make my all-time favourite Wang Brenda bag a company but the tangerine beauty will do for now. Also this version could be the next acceptable alternative. And how do you protect/carry your camera around? You look amazing and the shirt is perfect! You look fantastic as always! Please let me know which camera and lens you use because your pictures always look amazing and I'm trying to achieve this same look. Beautiful outfit, you look incredible! Love your blouse. Love your bag. Love your style. cool style! i love it!!! Gorgeous photo! Amazing blog u have! 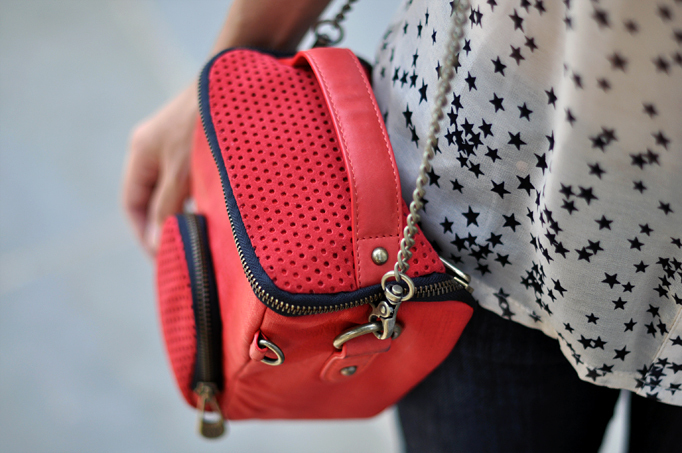 I love the matching lipstick and bag, such a great colour! можеш сказать от куда у тебя такая сумка? So pretty! Just love it! You are ridiculously flawless. Your facial structure is perfect! I never thought this Kipling camera bag was a good idea, 'cause Andy Torres designed it and never worn it once in her outfit post on StyleScrapbook. Just saying. You look gorgeous as always ! Love your top!!! You look so pretty!! It should be forbidden to be that pretty, seriously lol. It may be a casual and simple outfit but it's still really cute. I like it. Your hair are just perfect! I'm in awe of how beautiful that first photo is! It needs to be in a magazine! The first picture is such a favorite. You look stunning. The colors are divine, I like the spirit in it. I see you have the same passion as me! Firts photo is pretty beautiful!